Posted November 18, 2015 by Alex Harmon & filed under Bar, Cocktails, Eat & Drink, Foodie Diary, Travel. The rugged slate of canvas that is Cockatoo Island has an energy that’s unique to such an iconic piece of Sydney history. Mixing industry with creativity, the island has been home to convicts and shipbuilders alike, but these days it’s a space for artists, day-trippers and urban campers. However, if you’re after some indulgence, the newly opened Garden Apartments are the best place to rest your head for a night (or two). 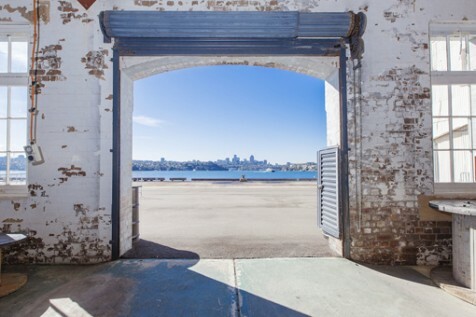 Situated on the upper plateau of the island, you’ll have view across Sydney Harbour to Woolwich and Hunters Hill. Once housing the Island’s medical officers and police, these two bedroom apartments have been given a luxury makeover, with a modern kitchen, spacious bathroom, large entertaining area with BBQ (make sure you pick up a brekky pack) and bedrooms with views of the city skyline. If you can pry yourself away from the apartment, a guided audio tour is a great way to while away the afternoon, where you can hear about the island’s rich tapestry of life, from prison escapees to the reform school for wayward girls. Follow it with cocktails at the Island Bar. Do consider booking in during the 20th Biennale of Sydney in March 2016; the location is perfect, now you don’t have to resort to swimming home! Rates: Monday – Thursday: $370 per night (mid week, one-bedroom option: $280 per night); Friday – Sunday (minimum two-night stay): $470 per night.